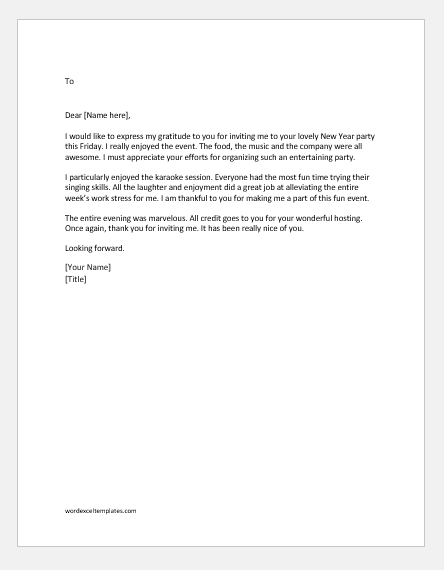 It is common courtesy to write a thank you letter to someone to express your gratitude for being your host. A host puts in a lot of effort to take care of you while you stay at someone’s house. Similarly, when you are invited over to a party, a get-together or simply for dinner, you are entertained through good food and company. It involves the efforts and hard work of your host. The least you can do for this favor and gesture of kindness is to send a special thank you letter to him/her. It is a mean of showing your appreciation and acknowledgement in a proper way. Although the basic content of the letter is the same every time, there are slight differences according to the situation. 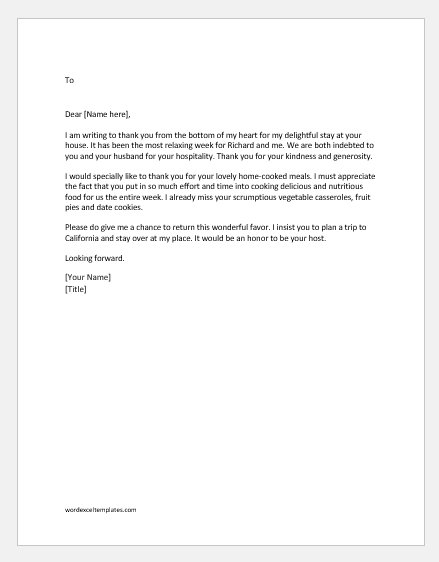 The following discussion explains how to compose a thank you letter for hospitality according to different scenarios. Your host takes care of you while you stay over at his house. He/she ensures your comfort, provides you meals and entertains you. This involves a lot of effort. It may also cause the host trouble in one way or the other. For instance, it may be a financial constraint on him/her to entertain guests. Therefore, do show your deepest gratitude for this hospitality through your letter. Tell your host that you had the perfect time at his/her house. You should also mention something specific that you are most grateful for. Wind up the letter by asking your host to visit your place as well sometime. It is courteous and polite to let your host know that you look forward to a chance of doing the same for him/her. Whether you are served a home-cooked meal or entertained at a restaurant for dinner/lunch, you should thank your host for this generosity. Appreciate his/her choice of the restaurant and state that you enjoyed the ambiance and the food. In case of a home-cooked lunch/dinner, praise him/her for the effort. Remember that cooking a meal takes effort and time. Therefore, express how grateful and honored you feel. You should also mention something in particular, for instance, a certain dish that you enjoyed the most. This will make your host feel appreciated for all the hard work and trouble. Party invitations are usually for special occasions like birthdays, New Year’s Eve, Christmas or for the celebration of a personal achievement. Thank your host for making you a part of their special evening. If he/she is celebrating an achievement, congratulate them and add some encouraging words for his/her future. Additionally, appreciate the party and state how entertaining and enjoyable it has been for you. A casual get-together may take place over tea, lunch or dinner. Thank your host for taking the trouble to arrange this get-together. Show your gratitude for giving you a chance for unwinding with friends over tea or lunch. Do appreciate the food and anything else your host arranged for your entertainment. Whatever the situation may be, a thank you letter must show your sincere gratitude for someone’s hospitality. It should be full of positivity and acknowledgment. State how obliged you are. It is also polite to reciprocate by inviting your host in order to return the favor. You may also follow up this letter by sending a small gift in order to further express your gratitude. Here are 2 sample letters written for different situations. I am writing to thank you from the bottom of my heart for my delightful stay at your house. It has been the most relaxing week for Richard and me. We are both indebted to you and your husband for your hospitality. Thank you for your kindness and generosity. I would specially like to thank you for your lovely home-cooked meals. I must appreciate the fact that you put in so much effort and time into cooking delicious and nutritious food for us the entire week. I already miss your scrumptious vegetable casseroles, fruit pies and date cookies. Please do give me a chance to return this wonderful favor. I insist you to plan a trip to California and stay over at my place. It would be an honor to be your host. I would like to express my gratitude to you for inviting me to your lovely New Year party this Friday. I really enjoyed the event. The food, the music and the company were all awesome. I must appreciate your efforts for organizing such an entertaining party. I particularly enjoyed the karaoke session. Everyone had the most fun time trying their singing skills. All the laughter and enjoyment did a great job at alleviating the entire week’s work stress for me. I am thankful to you for making me a part of this fun event. The entire evening was marvelous. All credit goes to you for your wonderful hosting. Once again, thank you for inviting me. It has been really nice of you.